Jersey Jack Pinball presents a world of pure imagination! Willy Wonka and the Chocolate Factory™ pinball machine - Collector's Edition model. LAKEWOOD, N.J., April 12, 2019 /PRNewswire/ — Jersey Jack Pinball presents a world of pure imagination! Find the Golden Ticket™ and enter Wonka’s Chocolate Factory™ for an unforgettable pinball adventure full of fun, surprises, and magic around every corner! This pinball masterpiece was designed by the legendary Pat Lawlor, designer of Dialed In!, Twilight Zone, and over a dozen other classic games, including the best-selling pinball machine in history, The Addams Family. All models of Willy Wonka and the Chocolate Factory™ pinball include four flippers, six balls, a captive ball, seven magnets, the Everlasting Gobstopper™, the Most Secret Machine™, Oompa Loompa™ camera sculpture, 7″ Wonkavision™ LCD, a 27″ HD LCD screen with interactive 3D animations, and candy-colored LED light shows. Gameplay features four multiballs, collecting Wonka Bars™, spelling Scrumdiddlyumptious™, touring Wonka’s Factory™, and a host of other goodies to lead you down the chocolate river to three wizard modes, including Pure Imagination™. Scenes and dialogue from the original 1971 film directed by Mel Stuart, starring Gene Wilder, are showcased bringing this exciting theme to life. 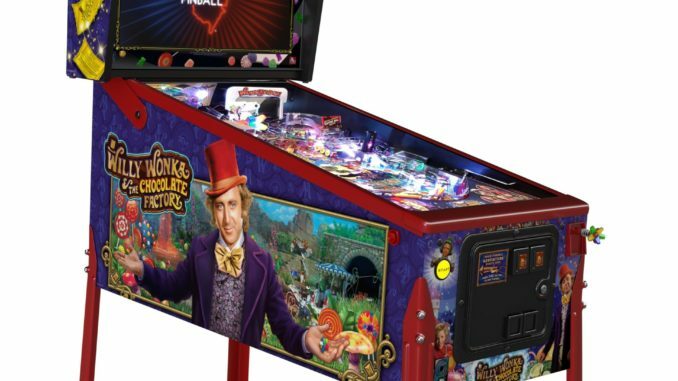 Willy Wonka and the Chocolate Factory™ pinball machines will be available in Standard, Limited, and Collector’s Edition models. Only 500 units of the Collector’s Edition model will be made! MSRP for sales in the U.S. before any taxes and shipping. Jersey Jack Pinball (JJP) is the industry leader in quality and technical innovation, designing groundbreaking, premium pinball machines made for players, collectors and newcomers to the game. Made in America, their head-turning machines are crafted by artisans and innovators with a nod to the game’s rich history and an eye towards the future. Ontario Trillium Foundation Launches Knowledge Centre.